These mashup storybooks combine the whimsical storytelling of Doctor Who with the humor, color, and simplicity of the classic Hargreaves style. 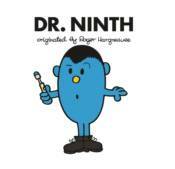 This all-new Doctor Who adventure features the ninth Doctor reimagined in the style of Roger Hargreaves. This collaboration is inspired by Doctor Who and the World of Roger Hargreaves and brings to life Doctor Who characters in the distinctive story-telling and illustrative style of Roger Hargreaves.